We offer Umbilical Cord Clamps that are precisely designed in compliance with the preset industry norms. Our Umbilical Cord Clamps are made from quality-tested materials. They are safe for clamping the umbilical cord of the newborn. 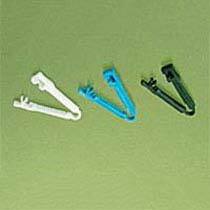 Umbilical Cord Clamps are available in blue, black and white colors.